Time to get down to business. The "Fours" are where kids begin having trouble with their multiplication facts. Counting is no longer an option, memorization is now required. This is the brilliance of Multi-Facts; the repetition required to complete each puzzle promotes memorization and Kids want to solve the puzzles. 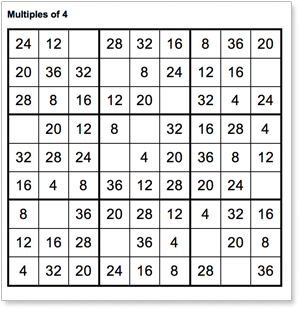 Fact ... For many kids memorizing the multiplication table is an extremely difficult task to accomplish. This tends to be the norm rather than the exception. Why ... because a typical multiplication table consists of 169 multiplication combinations that your child is required to memorize. It's the number one reason why so many kids struggle to learn them. The sheer number alone is overwhelming. Good Luck and Happy Learning!! !